Sophie Gengembre Anderson, (1823 – 10 March 1903) was the daughter of a Paris architect, Charles A.C. Gengembre, and a mother native to England. She studied portrait painting with Baron von Steuben in Paris. With the outbreak of revolutions in 1848 she immigrated to Cincinnati in the United States, where she married the British artist Walter Anderson. 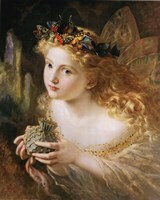 In 1854 she moved to England, exhibiting her works in the Royal Academy there the next year. Her works have been classified as belonging to the Pre-Raphaelite movement.